Four simple words from a Tech N9ne song help a young struggling artist from Noblesville, Indiana. Through his lyrics this young man tries to share the thoughts in his head with the world. He tries to tell of the path he has walked and all the sights he has seen along his 21 years. “Trapped In a Psycho’s Body” by Tech N9ne has been a song that he has always been able to relate to. He has questioned his sanity and struggled with the good and evil that dance on his shoulders, his mind pushed and pulled in each direction. Chris Johnson fought on, giving himself the name Bulletproof, he pushed back. “Words are like bullets. They can kill, change lives, start and end wars. So when I say I’m Bulletproof, not only is it to remind me of my own mortality, it is also saying that it doesn’t matter what you say to me at the end of the day,” the articulate young man states when explaining how he adopted the name Bulletproof and how it became who he is. Bulletproof has seen calm days and dark days with loud crushing storms. 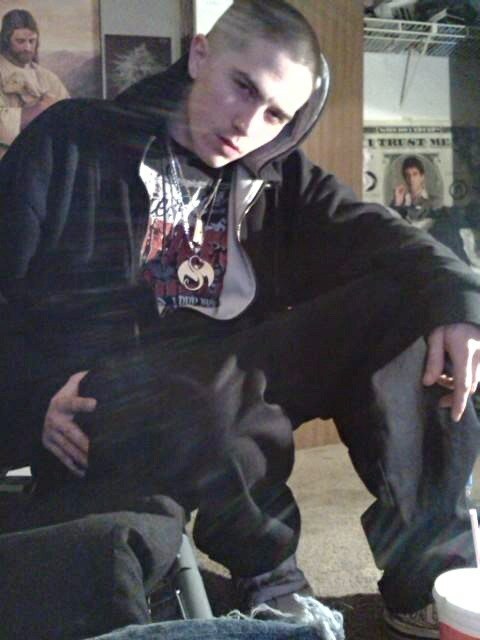 He says that Tech N9ne helped him to keep his sanity through the worst parts of his life. He felt as if Tech N9ne was telling the story of his life through his own words. Around the age of ten, his grandfather passed away, leaving his family to run the store his late grandfather owned. His grandmother from the other side of the family tried to run the store but had no background or knowledge of running a business, the employees saw this and that her management style was different than what they were used to, so they began to take advantage of her. Soon, his family had to close the store and sell it for a cheaper price. Also, the employee they rented their duplex from had also started to take advantage of his family and kept raising their rent. Eventually forcing his family from the duplex. Bulletproof’s parents tried to provide. His dad was a truck driver. His mom, unable to find a job to her content, changed jobs many times. They wanted him to believe that he and his family were middle class, but he began to notice they were actually poor. His parents left him with his brother and cousins a lot, making them his example to life. Bulletproof learned from the direction of his brother…until his brother began to get in trouble with the law and in school. He was soon given the choice of reform school or moving to Tennessee to live with his mom. Of course, he chose his mom’s. When he was 12 years old, Bulletproof’s great grandma passed away, leaving his family her home. He felt he was different to his peers. His family being less fortunate made him a little different than the rest and quite possibly a little strange! So he turned to drugs for comfort, also he turned to different kinds of music. This music included metal, Psychopathic Records and of course, Tech N9ne. This is the same time that he started really hearing Tech N9ne’s music. He was captivated by the message Tech was putting out there, he was impressed by the speed in which Tech could lay his words. But most of all, he could relate with the stories Tech was telling. He felt it was so close to his own life and story. Bulletproof will always remember that Anghellic was the first album that he really heard, this would keep him listening to Tech, keeping this young man from feeling alone, not just in the world, but his own mind as well. Inspired by Tech N9ne, Bulletproof wrote his first rhyme at 12 years old. His dad’s adopted son laughed at him but that didn’t stop Bulletproof. He stayed true to his self-given name. By the age of 15, he was recording his own music. When he doubted his own skills, his friend Nick aka LaChe pushed him to continue. Together, Bulletproof and LaChe met Big Young aka The Fool. Big Young had made music all his life and was signed to Black Market Records until he was incarcerated in 1992. Big Young became a influence on Bulletproof. Though Bulletproof still found trouble, he credits Big Young to keeping him from finding more trouble. While many parts of his life were falling into place, Bulletproof’s family life began to turn again. His mom left his dad and took him out of school because of the many problems he was having there. Finding himself in fights, unable to get to class, and in trouble with his teachers, his mom believed that him going to work would be a better option. Bulletproof saw his dad struggling to pay bills so he resorted to selling weed to help. Soon after this new twist, he and Big Young started making music together. Though his music was starting to come together, Bulletproof had deep-running conflicts of right and wrong. He had failing relationships with in his family, with so-called friends and with females. But Bulletproof kept his story flowing. His music today is from his heart and his flow is an art form. Through his smoky voice, he tells his story and speaks his mind. The passions in his music are definitely portrayed through how he puts it all together. If he never heard Tech N9ne, would Bulletproof have found his voice? Would he have made it through his self-doubt of his own sanity? These are answers that may never be known, but it is known that Bulletproof has made it through. He may continue to struggle but there is a possibility that others will hear his music and maybe one day, be telling the tale of how Bulletproof inspired them and kept them sane through the insanity of their life. Click here for music from Bulletproof and Big Young. Like Bulletproof and Big Young on Facebook.